University of Cambridge physicist Stephen Hawking stunned Israel last week with his announcement that he would boycott the fifth annual Israeli Presidential Conference, scheduled to be held in Jerusalem, June 18-20. Hawking was responding to an incongruity: He had been invited to attend an Israeli conference of scientific, economic and political world leaders under the lofty title: “The Human Factor in Shaping Tomorrow”. Many usual political suspects are expected to speak at the conference, including noted Israeli friends Bill Clinton and Tony Blair. Also listed as speakers are Stuart Eizenstat, Larry Summers and David Axelrod. George W. Bush was a speaker for the 2008 inaugural conference. As a matter of conscience, Hawking will not be there. What makes this conference such an incongruous event is that it will hold its “Shaping Tomorrow” sessions in close proximity to what is essentially a prison wall built to separate an occupied, entrapped Palestinian population, from the rest of the world. Is this the future Israel would have us shape? Prison walls enforcing ethnic cleansing? “However, I have received a number of emails from Palestinian academics. They are unanimous that I should respect the boycott. In view of this, I must withdraw from the conference. Had I attended, I would have stated my opinion that the policy of the present Israeli government is likely to lead to disaster”. The term “boycott” is part of the Palestinian civil society’s Boycott, Divestment and Sanction (BDS) non-violent campaign, a grassroots movement launched in 2005 to non-violently bring an end to Israel’s occupation of Palestinian land and people. Israel is holding its fifth conference in close proximity to the Israeli-built prison wall that enforces that occupation. Stephen Hawking has not been known for political activism. His story unfolded in a different arena. It is a story of his enormous personal courage and significant achievement as a physicist and cosmologist. Hawking, who tells his personal story in “Living With ALS“, has to be the most high-profile invitee yet to boycott an Israeli Presidential conference, an event which in the past has attracted little media attention. Hawking has changed that. But like his mind, Hawking’s illness seems to be singular. Most patients with ALS—also known as Lou Gehrig’s disease, for the famous baseball player who succumbed to the disease—are diagnosed after the age of 50 and die within five years of their diagnosis. Hawking’s condition was first diagnosed when he was 21, and he was not expected to see his 25th birthday. Hawking is the sort of high profile public figure whose boycott action is most feared by Israel. Witness the speed with which the pro-Israel lobby seized on Cambridge University’s initial false claim that he had withdrawn on health grounds to denounce the boycott movement, and their embarrassment when within a few hours the university shamefacedly corrected itself. Hawking also made it clear that if he had gone he would have used the occasion to criticise Israel’s policies towards the Palestinians. 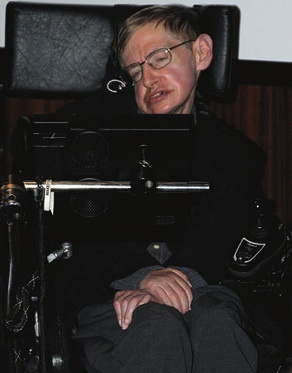 While journalists named him “the poster boy of the academic boycott” and supporters of the boycott, divestment and sanctions (BDS) movement celebrated, Ha’aretz, the most progressive of the Israeli press, drew attention to the inflammatory language used by the conference organizers, who described themselves as “outraged” rather than that they “regretted” Hawking’s decision. The Times of Israel made a feeble attempt to defend conference organizers. There is considerable irony in Israel’s promotion of its scientific achievements within strolling distance of the “prison wall” it built to deprive Palestinians of their freedom. My experience has taught me that people tend to underestimate the tremendous ability within them, and yet mankind has the power to make a difference to ensure the betterment of our collective tomorrow. What should be more reassuring, however, to those sensitive and compassionate Jews who live under a government based on lies and deception, is a Boston Globe editorial which found Hawking’s boycott decision to be a “reasonable way to express one’s political views”. When the esteemed physicist Stephen Hawking announced his decision to boycott Israel’s Presidential Conference, a gathering of politicians, scholars, and other high-profile figures scheduled for June, the response was as predictable as the movement of the cosmos that inspired Hawking’s career. In fact, the decision to withdraw from a conference is a reasonable way to express one’s political views. Observers need not agree with Hawking’s position in order to understand and even respect his choice. The movement that Hawking has signed on to aims to place pressure on Israel through peaceful means. In the context of a Mideast conflict that has caused so much destruction and cost so many lives, nonviolence is something to be encouraged. That is equally true of attempts to inspire cooperation on the Palestinian side. Chances for a peaceful solution in Israel and Palestine are remote enough without overreactions like Maimon’s. Foreclosing nonviolent avenues to give people a political voice — and maybe bring about an eventual resolution — only makes what is already difficult that much more challenging. As they used to say in the American South where I grew up: “That will preach, brothers and sisters”. The picture of Hawkin, above, is from Wikimedia Commons. It appeared in the Scientific American. How not to cross a picket line, by Stephen Hawking. Thank you, Mr. Hawking! And as an aside, I went to the Beinart/Dershowitz debate last week at CUNY, NYC, where Dershowitz called the greatest scientist of our day an “ignoramus.” Talk about making yourself look small! any other free state on the globe. the Middle East. If x=y, and y=z, then x=z. a valid theory. they are courageous enough too. Hawking’s boycott of the conference may spur the push for the release of Palestinian academic, Ahmed Qatamesh, who is falsely imprisoned in Israel. Thank you for an excellent review, Jim. This is a formidable story that our mercenary-media and politicians tried to snuff out and keep under the radar screen. Let us not allow mainstream media the pleasure of a “one-time news story” that disappears in the ultra-deep sink hole of colonial Zionist deception. Like many thousands of people around the world, I salute Stephen Hawking for his brave and electric stand that has Israel’s Apartheid regime scrambling like a chicken the head of which was snapped. “Hawking Against Apartheid & Occupation” brings the shivers to Israel’s “Spin & Deception Pundits”, as well as, to Israel’s Apartheid-colonial-expansionist-nuclear-armed regime itself. The best thing all supporters of justice, freedom, peace and human dignity can do is to relentlessly promote BDS and to: SPREAD THE WORD; SPREAD THE WORD; SPREAD THE WORD; SPREAD THE WORD. Thank you Jim, for the report and we should all thank Hawking for his bravery, in spite of his having ALS, to “speak” so profoundly truth to power. May this be the moment we have all prayed for.